Posted June 8th, 2016 by Mobile Music School & filed under Music Lessons, Percussion Lessons. 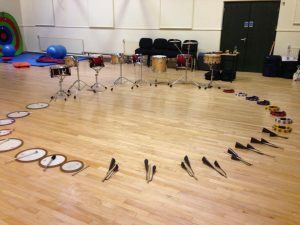 On May 23rd 2016, Shay Lally, from the Mobile Music team, and Brian Malone, a school teacher in St Paul’s, devised a special musical workshop for the pupils of St Paul’s SNS. The students have been receiving ‘Music in the Classroom’ and ‘Percussion in the Classroom’ lessons from us since September 2012. With each fun-filled music programme we deliver, it’s a pleasure for us to witness the dramatic enhancement in pupils’ musical skills and abilities. On the day, each class group received a 60-minute musical session, in which they explored the instrument, timbre, tone and sound of the percussion family. The students of St Paul’s Senior National School thoroughly enjoyed the opportunity to learn more about the percussion family. As a former session drummer, Brian was able to bring his Drum Kit and demonstrate his skills to the children. They learned all about the different drums and cymbals, as well as the general components of a drum kit. The children were delighted to get a chance to play a standard “Rock Beat” on the drums. Shay demonstrated some orchestral percussion instruments from his RTÉ Concert Orchestra days. The children learned all about the snare drum and how, historically, it was used by armies entering battle. They then listened to the sounds of the Marimba and also enjoyed being introduced to the Glockenspiel. All in all, the children thoroughly appreciated the workshop. We were happy to hear that the drum kits and the sounds from the Marimba sparked a particular interest in some of our students. To learn more about the drumming workshops offered by the Mobile Music School along with our other music classes, please visit the Primary School Workshops and Secondary School Workshops sections on our website.